SINGAPORE (May 25): Relatively weak consumption growth is likely to persist across G7 nations this year, says Oxford Economics on the belief that the impact of a recovery in real incomes will be dampened by higher oil prices and waning wealth effects going forward. The research firm’s baseline forecast is for G7 household spending growth to remain broadly stable in 2018, but for the key drivers – namely income, housing wealth, equity wealth and interest rates – to rotate. “Central banks appear to have pulled off a remarkable – albeit grating – stability in post-crisis G7 activity and consumption. Ultra-loose monetary policy helped slow household deleveraging, which is only now complete in the major economies,” remarks Gabriel Sterne, Oxford Economics’ head of global macro research, in a global research briefing report on Thursday. “This stability can be maintained if quantitative easing’s (QE) asset-led impetus recedes just as real incomes pick up, perhaps bolstered by an upturn in the household debt super cycle,” he adds. In particular, Sterne believes consumption will outstrip GDP growth in only one out of 12 large advanced economies, namely Canada, as consumption returns to passenger-status. The research head notes that while moderate post global financial crisis (GFC) consumption growth has reflected a mix of weak wages mirrored by strong growth in employment by far, global incomes are facing a tepid outlook. As such, he continues to see a “steady yet unspectacular” pick-up in pay as well as subdued gains in productivity. “The advanced economy labour share (of GDP) has been in the doldrums for a decade and shows only limited signs of recovery,” observes Sterne. Further, given the lags in the impact of world equity prices on world GDP, Sterne thinks 2018 will be a peak year in terms of the impact of buoyant equity prices on consumption. He points out that while wealth effects were key channels by which quantitative easing (QE) and ultra-low interest rates sustained consumption in the tepid post-crisis recovery, Oxford Economics simulations using its Global Economic Model suggest that a 15% change in world equity prices could change the level of world GDP by 0.4-0.7% in the next two years ahead. “Strong growth in housing and equity wealth have supported G7 consumption in the post-crisis period, though our models suggest a lower contribution going forward,” says Sterne. Referring to the sharp fall of housing’s impact on consumption up to 2014, the research head attributes this to weak mortgage equity withdrawal (MEW) since 2008, which has in any case been associated with wealth effects that appear subdued given the sharp increase in prices. On the downside, the research head warns that central bank gradualism could be wrecked by an inflation surprise if higher rates reveal balance sheet weaknesses. These risks however appear mostly contained, in the research head’s view, as he believes there are limited pockets of credit risk and vulnerability to higher rates. Conversely, he also sees potential upside risks arising from balance sheet expansion and strengthening wealth effects. Going forward, Sterne identifies longer-term trend drivers of global consumption, such as household re-leveraging, as a positive force driving the consumption share. He notably expects Asian economies to continue their shift towards being more consumption-driven with the maturation of these economies, as demand for services such as tourism and healthcare become increasingly important. 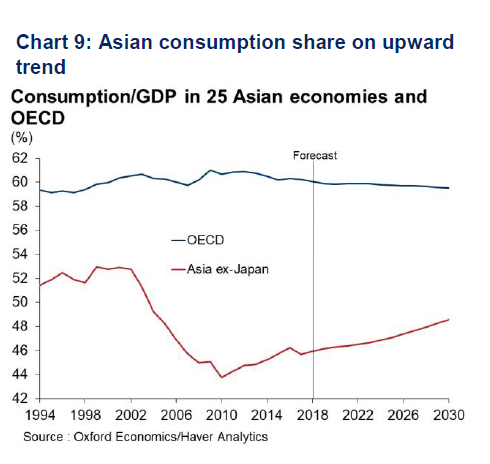 “We see two positive longer-term drivers of the global consumption share: Asian economies will become more consumption-driven; household re-leveraging offers scope for some debt-fuelled consumption growth. Offsetting negatives are that demographics, interest rates and asset prices will provide little support,” concludes the research head.